I love when they come out with children's designs on products they should be using. It makes it so much easier for us parents and grandparents while helping them want do what they are already suppose to. I don't know about you but my grandchildren all have a Frozen favorite character and Star Wars, well it has been a children's favorite forever! 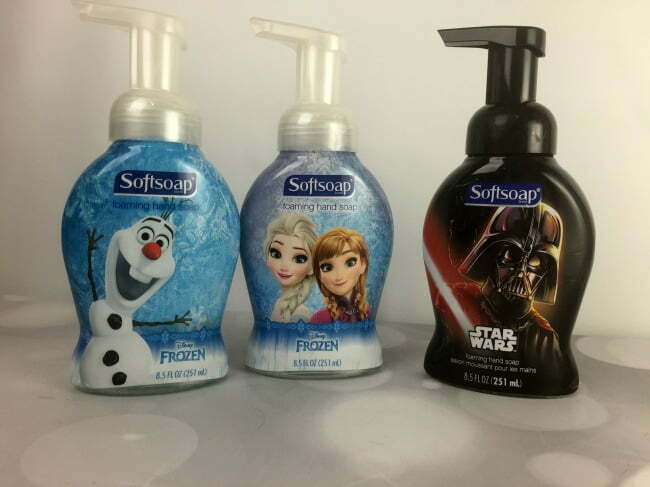 Softsoap has introduced a new product line for kids, the Softsoap Frozen & Star Wars collection. Let's face it it's hard to get kids to want to wash their hands, having a favorite character on the soap bottle helps! :) Check out our review & SoftSoap Practical Gift Ideas! The bloggers helping promote this giveaway were not compensated. Modern Day Gramma and the bloggers promoting this giveaway are not responsible for prize fulfillment. You must be 18 years of age or older to enter this giveaway. Giveaway will end at NOON CST on December 17th, 2016. The winner will be randomly chosen and announced on December 18th. Winner will have until December 20th (TUESDAY) to reply with their shipping information. That is 24 hours! A new winner will be selected if a response is not received. Once a winner is drawn and confirmed, the name will be announced on the GiveawayTools form. Open to US Residents Only. They have so many great scents! I love the Blackberry Scrub or the Strawberry. And, of course, it is very affordable. I learned all their packaging is recyclable. I like the Frozen or Star Wars kids hand soap. I learned they offer new fragrances all throughout the year. I learned that all their packaging is recyclable. I read that All Softsoap brand formulas are gentle enough for use by the entire family, including the littlest members. I learned that they do not intentionally add gluten to any of our other products. I learned that All Softsoap® brand products are formulated — and tested — to have a shelf life of at least two years from the date of manufacture. For best results, though, products should be used within one year of opening the package. I learned that they stay fresh for up to 2 years. I learned that they stay fresh for 2 years...I never thought soap expired :). I learned that most of there soaps do NOT contain animal by products. Thank goodness.